A look behind the scenes into why Geography matters, as students around the country prepare for the 2011 National Geographic Bee. Learn why it's important from an Ocean Explorer, Global Rower and Adventurer. After setting out on Saturday 29 January at 11:07:28 GMT on his attempt to break the solo round the world record, Thomas Coville and his 105ft maxi-trimaran Sodebo crossed the finish line off Ushant today, Thursday 31 March at 12:15 GMT) after 61 days, 7 minutes and 32 seconds at sea. This was 3 days, 10 hours, 43 minutes and 26 seconds longer than the time of 57 days 13 hours 34 minutes and seconds Francis Joyon managed aboard IDEC when he set the record in 2008. Ironically now the numbers have been crunched Sodebo's latest lap may have taken longer but was actually carried out at a faster speed than Joyon's. Sodebo covered 28,431 miles at an average of 19.42 knots, or 2,031 miles more than that sailed by Joyon, who covered 26,400 miles at an average of 19.11 knots. This was because due to less favourable weather conditions, Coville wasn’t able to follow as direct a route as the record holder. Today on the water conditions were similar to when Sodebo departed two months ago, but the maxi-tri was kicking up plumbs of spray from her damaged starboard bow. On finishing, Coville spun his giant Irens-Cabaret design south for her homeport of La Trinité sur Mer, SW Brittany. "When you see her here, you say to yourself that ultimately it’s a simple feat: this boat which was my companion for 60 days. You transfer human qualities onto her, but when you’re far away from land, she is your shelter, your survival, above all else." A few minutes earlier, the skipper had raised his head, looking at the crowds along the quay. With tears in his eyes, he exchanged glances with the anonymous faces, who had come to listen to what the sailor had to say on his return from a two month solo circumnavigation of the globe. The cork wouldn’t budge and ended up being cut with a knife; the same knife the skipper had with him aboard at all times. “This is for those who attempt things… in life you have to attempt things guys!” Coville proclaimed to those who had gathered at sunset to see him in. He sprayed the support team and took a mouthful before giving the bottle to the members of his team. “When we arrived off Ushant this morning, the timekeeper hadn’t even seen me. It was me that gave him the final time,” he began. “On arriving at Trého earlier (the channel into La Trinité), it was like an Etch-a-Sketch, you know, the kids’ toy where you can do some doodling and then erase the whole lot with a sweep of the stylus! It suddenly takes you right back to scratch. Today, that Etch-a-Sketch is you! It’s also my wife, my kids, this Sodebo family, this business with whom we’ve built this adventure. There’s a major human element in all this. Even though I’m showing off in front of you, I’m a competitor at heart and this hurts”. In what is now a dark night, the scene is reminiscent of a comfortable living room where tales of the sea are told by the fireside. After struggling to better ‘the perfect course traced by Francis Joyon” for the third time, the skipper of Sodebo tonight paid homage to the sailor, who remains the fastest man around the world, singlehanded aboard a sailboat. “In a world where oil escaped from the sea bed for weeks on end offshore of New Orleans, a world where nuclear power stations are throwing out radioactive clouds and where seawater has been irradiated to the extent that it has damaged life for generations to come, Thomas Coville has proven, through his journey around the world under sail, that natural energies aren’t lacking in strength. The fact that he hasn’t beaten the round the world record isn’t the most important thing. The key to this journey is that our circumnavigations of the globe, in crewed as well as solo configuration, have been more effective under sail than under power. "Right now, no boat powered by an engine has managed to circumnavigate the globe as quickly as we do under sail, due to their weight and range associated with the massive amount of fuel required aboard. Congratulations to Thomas for this fast, damage-free journey across the ocean. Parts of the content that are normally pushed outside the screen by scrolling are distorted to keep them within the screen. This enables users to navigate around the map while keeping an eye on the parts of the map that were originally on the screen. Scrolling is one of the most frequent actions made in interacting with touchscreen devices. For me it’s such a basic action that I actually didn’t think too much of it, until I saw this new control interface developed by a research team at Osaka University. Called the Flex, it’s a touchscreen interface that basically distorts the contents of the screen when you put your finger down and scroll, as opposed to scrolling immediately. When you let go of the screen, then the content will warp back into its original shape, scrolling in the process. What are the advantages of having an interface that distorts the content before scrolling it? First, it lets you preview what you’re going to see when you scroll before you actually scroll. With today’s interface, the moment you move your finger to scroll the content immediately moves. With Flex, you can for example distort Google Maps in several directions and quickly preview the surrounding area while still seeing where you originally were on the map. Flex also makes it easier to go back to where you originally were on the screen, although with small touchscreens like on smartphones that second advantage might not be too noticeable. The researchers also claim that Flex could be easily integrated into any touchscreen-based device, so don’t be surprised if you find yourself being able to distort the screen of your next phone or tablet. Scientists say the data gathered by the super-sleek space probe is bringing a step change in our understanding of the force that pulls us downwards and the way it is shaping some key processes on Earth. Chief among these new insights is a clearer view of how the oceans are moving and how they redistribute the heat from the Sun around the world - information that is paramount to climate studies. Those interested in earthquakes are also poring over the Goce results. The giant jolt that struck Japan this month and Chile last year occurred because huge masses of rock suddenly moved. Goce should reveal a three-dimensional view of what was going on inside the Earth. "Even though these quakes resulted from big movements in the Earth, at the altitude of the satellite the signals are very small. But we should still seem them in the data," said Dr Johannes Bouman from the German Geodetic Research Institute (DGFI). Look at the potato and its slopes. Put simply, the surface which traces the lumps and bumps is where the pull of gravity is the same. Even so, a boat off the coast of Europe (bright yellow) can sit 180m "higher" than a boat in the middle of the Indian Ocean (deep blue) and still be on the same level plain. This is the trick gravity plays on Earth because the space rock on which we live is not a perfect sphere and its interior mass of rock is not evenly distributed. The Gravity Field and Steady-State Ocean Circulation Explorer (Goce) was launched in March 2009. It flies pole to pole at an altitude of just 254.9km - the lowest orbit of any research satellite in operation today. The spacecraft carries three pairs of precision-built platinum blocks inside its gradiometer instrument that can sense fantastically small accelerations. This extraordinary performance allows it to map the almost imperceptible differences in the pull exerted by the mass of the planet from one place to the next - from the great mountain ranges to the deepest ocean trenches. Just getting it to work has tested the best minds in Europe. "Ten years ago, Goce was science fiction; it's been one of the biggest technological challenges we have mastered so far in the European Space Agency," said Dr Volker Liebig, the organisation's director of Earth observation. "We measure one part in 10 trillion; that's beyond what we understand in our daily experience." An initial two months of observations were fashioned into a geoid that was released in June last year. The latest version, released in Munich at a workshop for Goce scientists, includes an additional four months of data. A third version will follow in the autumn. Each release should bring an improvement in quality. "The more data we add, the more we are able to suppress the noise in the solutions, and the errors scale down," said Dr Rune Floberghagen, the European Space Agency's Goce mission manager. And of course the more precisely you know the geoid, the better the science you can do using the geoid. "We are seeing completely new information in areas like the Himalayas, South-East Asia, the Andes mountain range, and in Antarctica particularly - the whole continent is desperate for better gravity field information, which we are now providing." 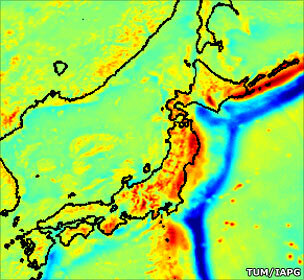 Goce sees gravity differences at Japan and the tectonic boundary (blue) that triggered the quake. One major goal of the Goce endeavour is to try to devise a universal reference for mean sea-level. This would make it possible to compare the true heights of things anywhere on the globe. "We hope that after completion of the mission we will have one unified global height system," explained Professor Reiner Rummel, the chairman of the Goce scientific consortium. "Usually, heights in the UK, say, are connected to one benchmark which is connected to mean sea-level, which might be measured at Liverpool, for example. The French do the same, the Australians do the same and the Chinese do the same - but mean sea-level differs from one country to the next. Now, with Goce, we can unify this so that we don't get the sort of surprises we had when they built the Channel Tunnel and discovered a half-metre offset between the UK and France." The mission has funding up until the end of 2012 when, like all European Space Agency Earth observation missions, it must seek further financial support from member states to continue. Goce has delivered the data promised in its primary mission - some 14 months of observations in total - but researchers would like to see it fly for as long as is possible. Because it operates so low in the sky - a requirement of being able to sense gravity signals which are incredibly weak - it needs an engine to push it forwards through the wisps of atmosphere still present at its altitude. Without this engine, Goce would rapidly fall to Earth. But the mission team reported here in Munich that Goce probably has sufficient propellant onboard to drive its engine until deep into 2014. Icebergs cool and dilute the ocean water they pass through and also affect the distribution carbon-dioxide-absorbing phytoplankton in the Southern Ocean, according to a team of researchers from UC San Diego and the University of San Diego. The effects are likely to influence the growth of phytoplankton in the Atlantic sector of the Southern Ocean and especially in an area known as "Iceberg Alley" east of the Antarctic Peninsula (NSF photo gallery). Enhanced phytoplankton growth would increase the rate at which carbon dioxide is removed from the ocean, an important process in the carbon cycle, said the leaders of the National Science Foundation (NSF)-funded study. The results appear in the journal Deep-Sea Research II in a paper titled "Cooling, dilution and mixing of ocean water by free-drifting icebergs in the Weddell Sea." The main results from this paper were also highlighted in Nature Geoscience's March issue. "Iceberg transport and melting have a prominent role in the distribution of phytoplankton in the Weddell Sea," said paper lead author John J. Helly, who holds joint appointments at the San Diego Supercomputer Center and Scripps Institution of Oceanography at UCSD. "These results demonstrate the importance of a multi-disciplinary scientific team in developing a meaningful picture of nature across multiple scales of measurement and the unique contributions of ship-based field research." "The results demonstrate that icebergs influence oceanic surface waters and mixing to greater depths than previously realized," added paper co-author Ronald S. Kaufmann, Associate Professor of Marine Science and Environmental Studies at the University of San Diego. The findings document a persistent change in physical and biological characteristics of surface waters after the transit of an iceberg. The change in surface water properties such as salinity lasted at least ten days, far longer than had been expected. Sampling was conducted by a surface-mapping method used to survey the area around an iceberg more than 32 kilometers (20 miles) in length. The team surveyed the same area again ten days later, after the iceberg had drifted away. After ten days, the scientists observed increased concentrations of chlorophyll a and reduced concentrations of carbon dioxide compared to nearby areas without icebergs. "We were quite surprised to find the persistence of the iceberg effects over many days," said Helly, director of the Laboratory for Environmental and Earth Sciences at SDSC. The new results demonstrate that icebergs provide a connection between the geophysical and biological domains that directly affects the carbon cycle in the Southern Ocean. This research significantly extends previous research results conducted in the same environment and reveals the dynamic properties of icebergs and their effects on the ocean in unexpected ways. "These findings confirm that icebergs are a dynamic and significant component of polar ecosystems," said Roberta L. Marinelli, director of the NSF's Antarctic Organisms and Ecosystems Program. NSF manages the U.S. Antarctic Program, through which it coordinates all U.S. research on the southernmost continent and aboard ships in the Southern Ocean. 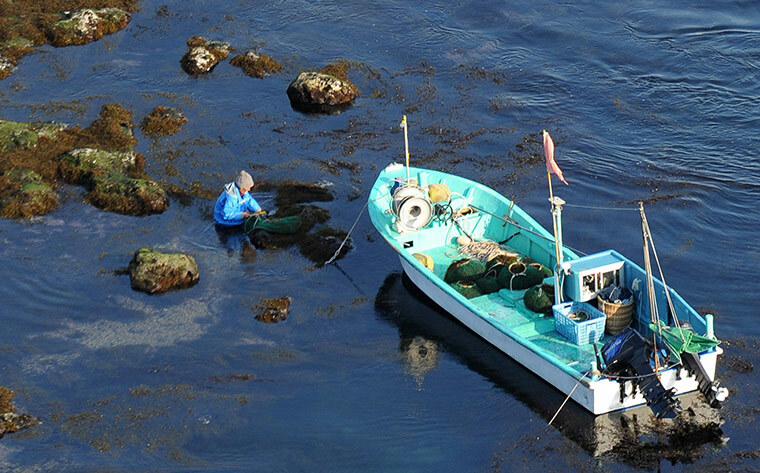 A fisherman collects seaweed in the Pacific Ocean near Katsuura city, south of Fukushima. Prime Minister Naoto Kan said his government was on maximum alert, and the situation remained "unpredictable". Japan's Nuclear Safety Agency said there was still no confirmation that radioactive water has seeped into the sea from flooded tunnels within the Fukushima Daiichi plant. Water levels in underground tunnels adjoining reactors 1, 2 and 3 had been stable, the agency said. Workers from plant operator Tepco have been piling sandbags and concrete blocks around the shafts, which lie between 55m and 70m from the shore, the agency said. Work to safely remove the contaminated water is a priority, government officials said, but stressed more water would need to be used to continuing cooling fuel rods. "We need to avoid the fuel rods from heating up and drying up. Continuing the cooling is unavoidable... We need to prioritise injecting water," Chief Cabinet Secretary Yukio Edano told a news conference. Tepco and the safety agency say the exact source of the radioactive leak is unknown. But, like the discovery of plutonium, the high levels of radiation found inside and outside reactor buildings are likely to have come from melted fuel rods. Engineers are battling to restore power and restart the cooling systems at the stricken nuclear plant, which was hit by a powerful quake and subsequent tsunami over two weeks ago. Operator Tepco has been accused of a lack of transparency and failing to provide information more promptly. It was also heavily criticised for issuing erroneous radiation readings at the weekend. On Tuesday, National Strategy Minister Koichiro Gemba said the government could consider temporarily nationalising the energy giant. His comments came a day after shares in the company dropped to their lowest level in three decades. The massive 9.0-magnitude quake and the subsequent tsunami on 11 March are now known to have killed more than 11,000 people, with at least 16,700 people still missing across north-eastern Japan. The authorities are struggling to identify about 4,000 bodies in Iwate, Miyagi and Fukushima prefectures. ''They were collected at places far from their residential areas (due to being swept away by the tsunami), or their families as a whole must have been washed away by the tsunami,'' a senior official at the National Police Agency was quoted by Kyodo news agency as saying. Police are posting information about clothes and physical appearance online, the report said. The breakdown of local administration has also left municipal offices struggling to assess the damage and casualties in some coastal areas devastated by the tsunami, national broadcaster NHK reports. Conservationists from the Wildlife Conservation Society, the American Museum of Natural History, and other conservation and research groups have discovered that groups of dolphins in the western Indian Ocean do not mix freely with one another. In fact, dolphin populations are kept separate by currents and other unseen factors. This is an Indo-Pacific humpback dolphin from the coastal waters of Oman, a country on the southeast coast of the Arabian Peninsula. The study appears in the advance online version of the journal Heredity. The study represents a breakthrough in high-tech research on marine wildlife and a foundation for ensuring sound future management decisions on the Indo-Pacific humpback dolphin, a distant relative of the more familiar bottlenose dolphin. It is one of the first examinations of how environmental factors in marine environments can influence population structure in marine species, and can potentially enhance an understanding about the environmental factors that may drive the evolution of new species. “Examining how environmental factors affect the population structure of marine species is a complex task. Doing this over entire regions is a challenge,” said lead author Dr. Martin Mendez of the Sackler Institute for Comparative Genomics at the American Museum of Natural History. The team started its examination of Indo-Pacific humpback dolphin populations using genetics, analyzing mitochondrial DNA data from more than 90 individual dolphins from the coastal areas of Oman, Mozambique, Madagascar, Tanzania, and South Africa. The scientists used this “genetic marker” to statistically measure gene flow between dolphin groups at different locations. The researchers then compared their molecular findings with 13 years of data from NASA’s satellites on environmental factors such as currents, temperature, turbidity, levels of chlorophyll, and dissolved organic matter. Dr. Mendez and his co-authors have succeeded in finding support for the hypothesis that environmental differences between regions could influence the population structure of marine species. Specifically, they found correlations between regional environmental differences and measurable genetic breaks between populations of dolphins from Mozambique and Tanzania in Africa, and Oman on the Saudi Arabian peninsula. 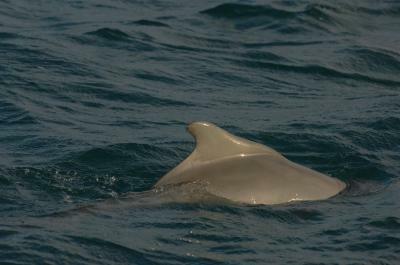 Occurring in mostly coastal habitats stretching from the western Indian Ocean to Australian waters, the Indo-Pacific humpback dolphin gets its name from the distinctive hump just below the marine mammal s dorsal fin (as in this individual animal from the coast of northwest Madagascar. On the largest regional scale, data on currents seem to correlate with genetic distinctiveness between certain populations. 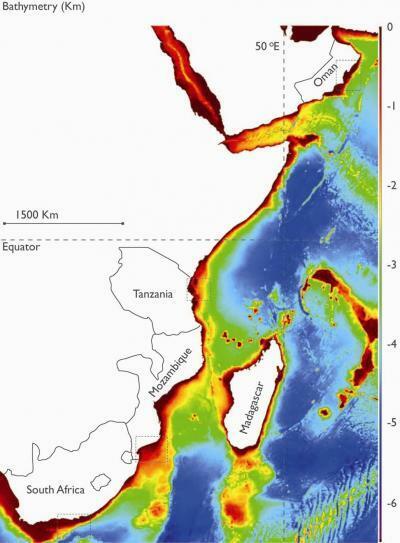 In particular, the South Equatorial Current—which runs west across the Indian Ocean before diverging north and south as it meets the African continent—seems to represent a barrier between genetically distinct populations of Mozambique and Tanzania; the current may play a role in creating them. Seasonal monsoons also potentially contribute to what researchers found was a lack of southbound migration (or detectable gene flow) along the African coast. The researchers also found agreement on smaller spatial scales. Differences in temperature, chlorophyll, turbidity, and dissolved organic matter between regions also coincided with genetic differences between dolphin populations in Mozambique, Tanzania, and Oman. The two coastal regions without detectable genetic distinctiveness between dolphin populations—Mozambique and South Africa—also lacked significant environmental differentiation between them, a finding in agreement with the correlation of both genetic and environmental differences detected in other areas. “With increasing development and potential threats to coastal habitats, understanding the population structure of the Indo-Pacific humpback dolphin in conjunction with environmental factors is an important step in formulating management recommendations and protection measures for the species,” said Dr. Howard Rosenbaum, Director of the Wildlife Conservation Society’s Ocean Giants Program. Named for a distinctive hump under the dorsal fin of some individuals, the Indo-Pacific humpback dolphin grows up to 10 feet in length and ranges from dark gray to pink and/or white in color. The species generally inhabits coastal waters, deltas, estuaries, and occurs throughout the Indian Ocean basin to the coasts of Australia. The Indo-Pacific humpback dolphin is listed as “Near Threatened” by the International Union for Conservation of Nature (IUCN) and is threatened by habitat loss, disruption, and fishing activity. Some shark species make "mental maps" of their home ranges, allowing them to pin-point destinations up to 50km (30 miles) away, research suggests. US-based scientists analyzed data from tiger sharks tagged with acoustic transmitters, and found that they took directed paths from place to place. Other species such as blacktip reef sharks did not show this behaviour. Writing in the Journal of Animal Ecology, researchers suggest this shows a capacity to store maps of key sites. In addition, it is further evidence that the great fish can navigate, possibly using the Earth's magnetic field. Earlier research in Hawaii had shown tiger sharks swimming across deep channels and finding shallow banks rich in food 50km away. 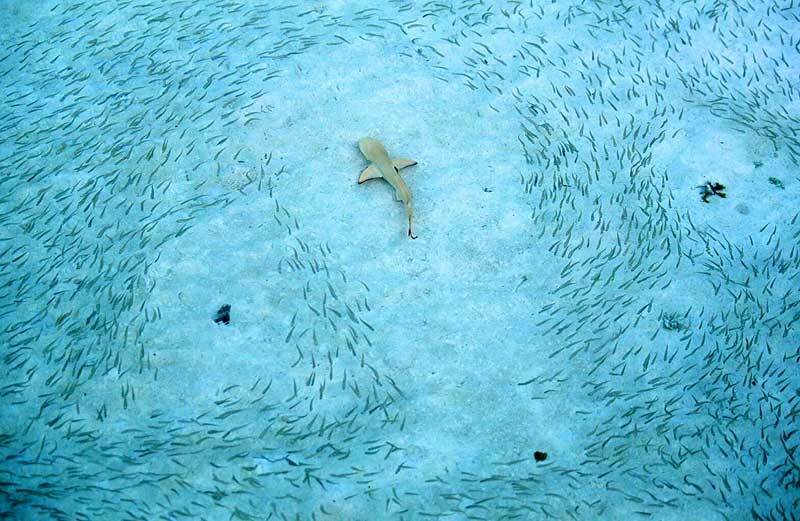 In this project, researchers used statistical techniques to show the journeys were not made by accident; the sharks were following some kind of path. A third species, thresher sharks, also showed "directed walking" like the tigers, but on much smaller scales. "Our research shows that, at times, tiger sharks and thresher sharks don't swim randomly but swim to specific locations," said research leader Yannis Papastamatiou from the Florida Museum of Natural History in Gainesville. "Simply put, they know where they are going." A key question is how they know where they are going. 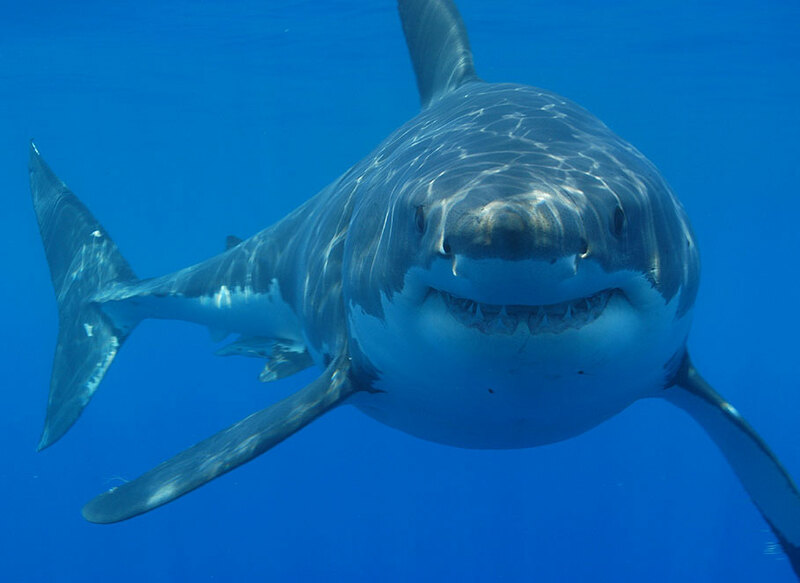 Sharks are among the wide array of animals that can sense magnetic fields. But whereas others, such as yellowfin tuna, apparently do this using small amounts of the mineral magnetite in their heads, sharks do not appear to maintain deposits of this magnetic sensor. Alternative possibilities are that they use signals from ocean currents, water temperature or smell. "They have to have a pretty good navigation system because the distances are great," Dr Papastamatiou told BBC News. "Which one it is is open to debate, but the fact that many of these journeys took place at night - you and I would think there's nothing to orientate to, so orientating to magnetic fields is one possibility." Among thresher sharks, adults made much longer directed journeys than juveniles. The researchers say this suggests the fish build up mental maps as they mature. The differences between species are probably explained by the varying ways in which they live. Blacktip reef sharks (Carcharhinus melanopterus), although widespread around the Pacific, appear to have small ranges within their home reef system. On the other hand, tiger sharks (Galeocerdo cuvier) can cover huge distances. Tags have been recovered from individuals more than 3,000km away from where they were attached. 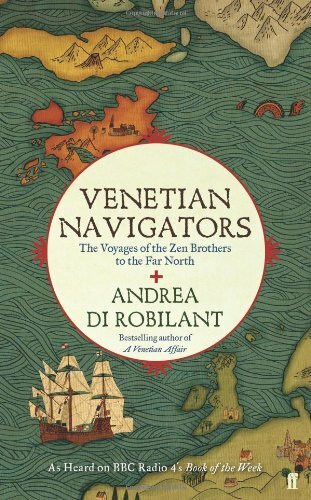 In his new book, Venetian Navigators, Andrea di Robilant sets out to investigate how much, if any, truth there is to the story that Antonio and Nicolò Zen really discovered the New World before Columbus. A curious book was published in Venice in 1558. Its author was one Nicolò Zen, a well-known official of the Venetian republic. In it, he made the extraordinary claim that his great-great-great grandfather Antonio and his great-great-great granduncle Nicolò had travelled around the north Atlantic as far as the coast of modern Newfoundland in the late 14th century – a whole century before Christopher Columbus’s American landfall. A facsimile of the Zeno map of the purported voyage of Nicolo and Antonio Zeno across the North Atlantic to North America in 1380. The map shows Norvegia (Norway), Denmark, Iceland, Greenland, and the fictitious Frisland. The book included a map depicting the places allegedly visited by the brothers. Though clearly inaccurate, this navigation chart, if genuine, is significant for offering the earliest known cartographical representations of the Faroe Islands, Greenland, Iceland and the eastern coast of Canada. Contemporaries had few doubts about the authenticity of Zen’s account of his ancestors’ travels. 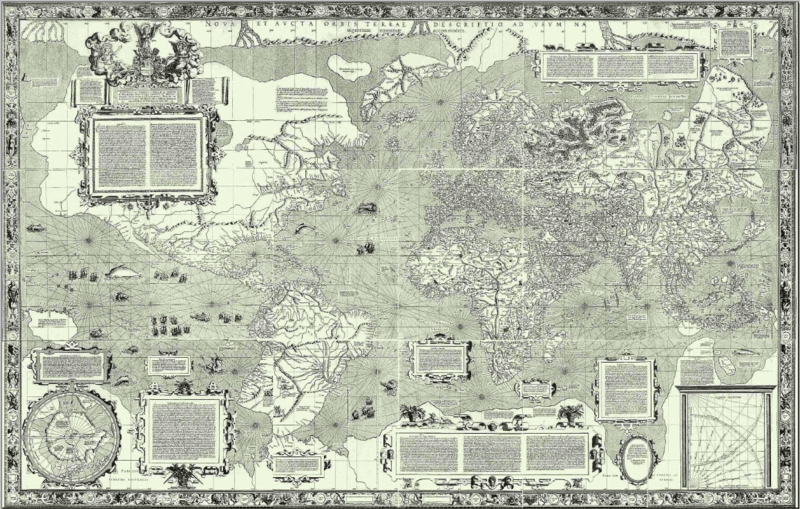 The cartographer Gerard Mercator incorporated some of the Zen map’s features into his own famous world map of 1569. John Dee, Queen Elizabeth’s favourite astrologer, seized on the Zen narrative to convince the monarch to support voyages of exploration. As late as 1701, charts still included references to the Zen “discoveries”. But as the golden age of exploration waned, and as mapmakers depicted the new world with increasing precision, the Zen narrative and its unusual map became footnotes in the history of geographical discovery. They would have languished in antiquarian obscurity were it not for a Danish geographer, Captain Christian Zahrtmann, who in the mid-19th century set out to prove that the tale was little more than “a tissue of fiction”. “Carta de Navegar” of Nicolo and Antonio Zeno – (the fictitious ‘Zeno map’). Published in Zeno’s ‘Commentaries’, 1588"
Was the book a factual (if wildly erroneous) account of geographical observations predating Columbus or was it, as another critic claimed, “one of the most successful and obnoxious [literary frauds] on record”? This is the question that historian Andrea di Robilant sets out to answer in Venetian Navigators. Di Robilant is, from the outset, prepared to give Nicolò the younger the benefit of the doubt. He has few compelling reasons to do so, except that it is such a great yarn – one that, if true, would up-end much of what we know about the age of discovery. While he comes to no definitive conclusions, by the end of his research he has fallen even more firmly into the camp that claims the Zen voyages might have actually happened. Pursuing clarity about the voyages, di Robilant visits libraries and archives in Venice, Tórshavn (Faroes), Kirkwall (Orkney), Lerwick (Shetland), Iceland’s Reykjavik, and Nuuk in Greenland. Most of the scholars he meets believe that the Zen story is “pure rubbish”, or “the handiwork of a two-bit Venetian swindler”. But di Robilant’s own journeys give him – and us – a good feel for the barren landscapes that the Zens might have encountered. We are introduced to extraordinary characters such as Villi, a blind Icelandic farmer who spends an afternoon discussing Icelandic poetry with di Robilant, and Silverio Scivoli, an Italian who arrived in Greenland 30 years earlier as a touring pianola player and moved in with a local woman. Di Robilant’s book is a bit muddled too – unsure, whether to lean towards scholarly antiquarianism or towards the first-person travelogue. The author is right, however, in suggesting that the Zen narrative and the debates it generated open a window on to the ways in which knowledge (geographical, in this case) is generated and appropriated. In setting out to elucidate a cartographical mystery, di Robilant has also shed light on the 16th century mind, caught somewhere between the middle ages and the Renaissance.